YEREVAN, Armenia (AP) — Albania qualified for its first major tournament by beating Armenia 3-0 on Sunday in its final qualifier for next year’s European Championship. The victory secured Albania second place in Group I, behind already qualified Portugal, and a berth at Euro 2016 in France. Denmark finished third and will have to go through a playoff to qualify. Albania players jumped up and down and hugged each other after the final whistle, with captain Lorik Cana crying as he celebrated with teammates. 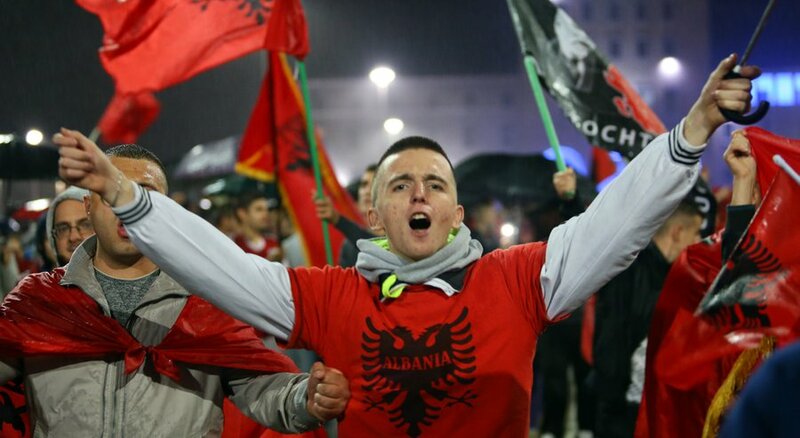 The win set off massive celebrations in central Tirana, with thousands of Albanians gathering in the city’s main Skanderbeg Square, honking their car horns and setting off fireworks. “The impossible dream turned into a reality!” Prime Minister Edi Rama wrote on Twitter. Albania opened the scoring with an own goal by Armenia defender Kamo Hovhannisyan in the ninth minute. It then added to the lead with a deflection by defender Berat Xhimshiti in the 23rd and a close-range goal by substitute Armando Sadiku in the 76th. Portugal, which had already clinched first place in advance, finished with a 2-1 win over nine-man Serbia, reaching 21 points from eight matches. The top two teams in each of the nine qualifying groups advance automatically, along with the best third-placed team. The eight remaining third-placed teams go to a playoff. Denmark had a bye this weekend and needed Albania to lose or draw its match against last-place Armenia in Yerevan. Hovhannisyan found his own net while trying to clear the ball from in front of the goal, and Xhimshiti scored by redirecting the ball into the net after a free kick cross from the left side of the penalty area. Sadiku’s left-footed shot sealed the victory. Albania did not concede a goal in its last four away matches. Without Cristiano Ronaldo, Portugal won its seventh consecutive qualifier by beating already eliminated Serbia in Belgrade. Portugal didn’t need to play at full strength after qualifying with the 1-0 win over Denmark last week. Nani scored in the fifth minute after Serbia goalkeeper Vladimir Sotjkovi failed to hold a shot from Danny, and Zoran Tosic equalized in the 65th before substitute Joao Moutinho netted the winner from the top of the area in the 78th. Serbia played the final minutes with nine men as captain Aleksandar Kolarov was sent off with a second yellow card in the 80th and Nemanja Matic received a straight red in the 81st.